The pool is a hit. AC and I have been in it almost every evening since we got it. It seems to relax her. 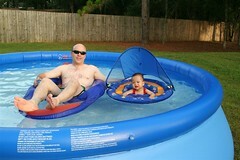 She just chills out and lets me pull her around in her float.